Though the tires work well in all conditions, they did not even last until 35,000 miles. The tires are currently at 33,220 miles and need to be replaced. They are worn to the wear marks and are suffering from dry rot. Would expect more for the price. Great tires for the Honda CRV !! Just installed a set to replace those miserable Bridgestone Dueler OEM junk tires that it came with and then took a 1,200 mile trip with the new Latitude Tours. What a quiet, comfortable ride, and practically NO road noise..... GREAT gas mileage too! Couldn't recommend a better tire for later model Honda CR-V/s. Will definitely buy again! We still have the original tires that came on the Equinox when bought new. We now have 88,000 miles on them. They have been rotated at the required intervals. It's been a very good tire for us. Bought the 65k mile tire thinking it would hold up. 43000 miles and the tires are at 4/32. Michelin customer service said they would give us 5% discount on new tires. Warranty isn't worth the paper its written on. Your best bet is to buy best price. If you dont believe me listen to one of their ads safe when new safe when old!!!! This tire is an accident waiting to happen. I hydroplane in heavy rain on the highway at speeds over 45 mph when everyone else is passing with ease. Traction in the snow is almost non-existent. I am throwing out these tires with half the tread life left to protect my life and the lives of my family members. Everything was great until about 30,000 miles. Tires dry rotted and actually blew a sidewall on one. Will see how Michelin stands behind their tires. I have 79,000 miles on my Equinox and these are the original tires. The dealership is just now recommending I "consider" changing them. They have held up so well that I will definitely only replace them with the exact same tire. I have traveled all across the United States and in all weather conditions and only once have I even had a flat tire. That was due to picking up a nail. I will definitely pay the extra price for these and "roll on" worry free for, hopefully, another 80,000 miles!! Thanks Michelin! 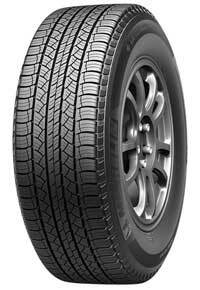 I purchased two of these tires for my Jeep Grand Cherokee limited. I love the way they look and how well the jeep handles with these tires. I also noticed that immediately after purchasing these two tires, I started getting better gas mileage. I am saving up now to purchase two more of these tires. I highly recommend these tires. These tires are the best SUV tires I have ever purchased. If you need to make your wife a happy camper these are the answer. These are the first pair of Michelin tires I have purchased and they are awesome. These tires handle great. My Mazda Tribute finally has a smooth and quiet ride. I would recommend these tires!!! I bought a set of these in September 2011 because of the Michelin reputation. The tires are wearing OK but have developed cracks around sidewall on each one, so after paying over 900 dollars for them and only 40k miles, I am very disappointed. Pending the outcome of adjustment, I probably won't buy Michelin again. This is the second set Michelins I have owned on this vehicle. Great, quiet ride. Great handling on wet roads. Good wear. No dipping out after they age. Price is a little higher than most tires but well worth the difference for a safer tire- my family is worth the difference. Does really well in the snow and ice for being just a 2 wheel drive pickup. These came as OEM on my 2012 GMC Terrain. Really liked them at first, however had to replace one tire after only 11 months (28k miles) because of a hole in the sidewall. Now I have a leak in one of my other front tires due to what I believe is a stone/pebble working it's way in to the tread. The 10/32 gap is too small and that's what I believe is the crux of the problem. Before I bought the Terrain, I had a Jeep Grand Cherokee that I put Cooper tires on. They were terrific! I think I'm going to go back to the Coopers when I change out. They have a deeper tread, go for at least 70k, and cost about 1/3 less than the Michelins. These tires are fantastic. I have 72,000 miles on them as they have been rotated and maintained properly. Great tires. Well worth the money. I have had these tires on my vehicle since I purchased it. There are 70000 plus miles on them with no problems whatsoever. Great in all weather conditions!! I love these tires. I would definitely buy these again, and I recommend them to everybody that has an SUV. These tires help me stick to the road, especially when I take a corner too fast. I live in Oregon (it's always raining) and sometimes it snows. I would never even think to look at another tire for my vehicle. You sure have my business. Came as OEM on vehicle on my wife's Equinox. At first, I was impressed but now after 39,000 miles my wife keeps getting flat tires once every month because very tiny stones picked up while driving on normal roads keep working their way through the tread. And it isn't even winter yet so they haven't started cindering the snow covered roads. Still have a lot of tread left but am considering replacing because I don't trust them anymore because of the flat tire issue. Have not driven in snow yet. Did have them before and did like the traction very much. After several thousand miles these tires have performed superbly. I replaced Michelins with Michelins, But the Lat Tour (100T) seem to have lower rolling resistance than the others, and I'm seeing about 3/4 of an MPG improvemrnt. They really roll nicely. Big John. Very Smooth and comfortable riding tire. Very good traction in the rain and snow. I feel safer in bad weather, knowing that I can stop shorter and have better control of my vehicle in any type of weather conditions.